Please Support Our Continuing Independent Film Making Efforts! Order your Award-winning BlastOff! Special Edition DVD today! BlastOff! wins a Silver W3 Award from the International Academy of the Visual Arts’ W3 Awards competition in the pioneering category of Web Video - Animation. Receiving over 2,700 entries, The W3 Awards honors outstanding Websites, Web Marketing, and Web Video created by some of the best interactive agencies, designers, and creators worldwide. BlastOff! wins an Official Honoree Webby Award in the category of animation, a distinction that recognizes work exhibiting remarkable achievement. Hailed as the “Oscars of the Internet” by the New York Times, The Webby Awards is the leading international award honoring excellence on the Internet, including Websites, Interactive Advertising, Online Film & Video, and Mobile Websites. BlastOff! is a pilot for an upcoming 3D animated web series where each night while a child sleeps in his BlastOff! Bed, his toy alien comes to life and flies through various space adventures. This 3-minute pilot webisode shows the BlastOff! Bed being constructed and its maiden voyage. BlastOff! tells the story of how the worlds of reality and fantasy easily blend together in the fertile imagination of a young child, especially when supplied with creative toys and environments. The story begins at dawn with a child’s wishful drawing of a space ship. During the day his father builds him a custom designed space shuttle bed and fills his room with toys. As the sun sets, one of the child’s toys, a little green alien, comes to life and is excited pretending to pilot the space ship. As his imagination soon takes over completely, the room fades away and the shuttle bed blasts the little alien out into space for a wild rocket ship ride through the rings of Saturn. The alien finally comes crashing back to reality as the child returns home to find his room is a complete mess. BlastOff! was inspired by the real BlastOff! Space Shuttle Bed that I designed and built for my son MJ when he was three and ready to graduate from his crib into a “big boy’s” bed. The story behind the design and construction of the original BlastOff! Bed was featured on HGTV’s new show Look What I Did! The BlastOff! Special Edition DVD includes behind the scenes content on 3D character animation including director & animator commentaries, actual LightWave 3D files of props & sets from the film, and the making of the real BlastOff! Bed , including construction video and photos as well as a BlastOff! Bed Construction Guide which includes the actual construction plans that I used to build the original BlastOff! Bed . BlastOff! sets the mood for adventure with a superb custom musical score by Adam DiTroia. 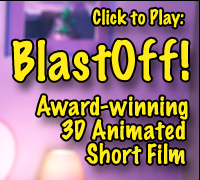 I’d love to hear what you think of my first 3D animated short film BlastOff! , so please submit a BlastOff! Feedback Form if you have any comments about it at all. DreamLight Interactive is an award-winning interactive multimedia studio built upon a solid foundation of computer science, design, illustration and animation. DreamLight has been pushing the cutting edge of digital media with twenty years of award-winning projects in a wide variety of computer graphics (CG) fields including 3D Animation & 3D Illustration, Interactive Multimedia & CD-ROM Development, and GUI Graphical User Interface Design & Web Development. Casting a 3D Character for BlastOff! LightWave 3D Props & 3D Sets from BlastOff! Building the Real BlastOff! Bed - the Custom Designed Space Shuttle Bed, as Seen on HGTV’s Look What I Did! Pass the legacy of NASA’s Space Shuttle program to the next generation. As Seen on HGTV’s Look What I Did! DLI_SNUB-Launcher™ is an XCode Aqua GUI front end to interactively configure and launch multiple LightWave 9.3-10 ScreamerNet UB instances for standalone, batch and network rendering. Download your copy today! Created by the author of Mastering LightWave ScreamerNet Rendering for Mac OS X, Michael Scaramozzino - LightWave 3D Artist Profile.